I spent most of my day off Tuesday sleeping. That was good and bad. I needed the rest, but neglected to get lots of stuff done that has to be done by the end of the week. Oh well. I left the house around 5pm to do some errands and the air and sky were quite smoky. Turns out there was a fire in the Hollywood Hills and the wind was blowing the smoke and ash in our direction. Luckily, no homes or people were harmed. 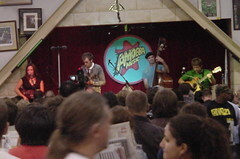 After errands, we went to Amoeba for the Nickel Creek in-store. Being the dork that I tend to be, I had the wrong time and they went on at 8, not 7. We were only able to stay for a couple of songs. Since we had time to kill, some purchases were made, of course. We picked up Nickel Creek's new cd and I got an import version of Rude Boy. Eric picked up some things from the deep discount bins (where we noticed that just about every Ben Affleck movie is available for $4.99! ), as well as the Special Edition of The Muppet Show: Season 1. 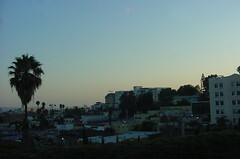 We left Amoeba and headed over to Largo for dinner and Jill Sobule. There was a small crowd, but she was great as usual. She came out into the room a couple of times to sing. She sat on the empty table next to us and sang "Underdog Victorious." During the song she spotted my Underdog t-shirt and had me stand up to show everyone. My blog is kind of repetitive. I'll have to think of some interesting things to write about as opposed to always writing "...we went to Largo again..." (well, we do go there fairly often). eh, i don't think it's that repetitive. besides, it keeps me in the loop with what you are up to. the other night when i ran into eric i knew more about what you were doing than he did! heh!